That at almost 75 years of age, and close to 50 years after the release of his debut album, Willie Nelson still manages to release music is impressive. The fact that he can release an album as fresh and timeless sounding as Moment Of Forever in 2008 is astounding. Willie’s career has taken on many phases, sounds and shapes. He’s been a legend so long now it’s hard to think of him as much else. Before he reached those heights though he had many other stops along the way. Outlaw is one of the titles he seemed to wear most proudly. It’s fitting then that he had Kenny Chesney produce this album. Chesney is one of the most successful acts in country today, yet at least by perception and reputation he seems to stand outside the Nashville mainstream and go his own way. Moment Of Forever does a fine job of combining Willie Nelson originals with well chosen covers. Dave Matthews’ “Gravedigger” retains enough of the original versions funky vibe while simultaneously being unmistakably Willie. “Takin’ On Water” has some organ parts that bring to mind mid 70’s Stevie Wonder in their soulfulness. “You Don’t Think I’m Funny Anymore” with it’s old juke joint stomping feel to it is the best of the Nelson originals on the album. The closer though, a cover of Dylan’s “Gotta Serve Somebody,” delivered with stirring conviction is the definitive highlight of the album. Chesney’s production is clean and streamlined. He doesn’t bog the album done with any unnecessary layers. He acts as a conduit to bring Willie and the songs directly through the speakers to the listener. 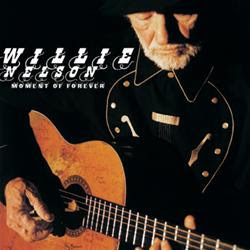 Detractors might point out that “Moment of Forever” isn’t quite ”Shotgun Willie” or “Phases and Stages.” And while that is true, “Moment of Forever” goes beyond what one can rightly expect from someone 50 years into a recording career.